The First World War, "The Great War", "The War to End All Wars", left Europe in economic ruin and the casualty rates were so great that many nations were robbed of an entire generation of manhood. The War also marked America's emergence as a world power, not just militarily, but more significantly, an economic power. While the European Powers emptied their treasuries to finance the War, American banks were happy to loan them the funds to destroy each other at highly favorable interest rates. The one true beneficiary of the Great War was the American Arms industry. During the early years of the conflict, America's policy of neutrality meant that munitions could be and were sold to both sides. The DuPont Company was founded in 1802 as a gunpowder mill near Wilmington, Delaware, by Éleuthère Irénée du Pont, who emigrated to America to escape the horrors of the French Revolution. In 1902, the company expanded on the production of dynamite and smokeless powder, establishing research laboratories to develop nonexplosive uses for cellulose. (The company published a pamphlet in 1910 titled "Farming with Dynamite".) As the Great War was beginning in Europe, DuPont was investing in General Motors and would diversify even more after hostilities ceased. However, a pacifist movement was developing and in the US Senate, the Nye Committee was formed to investigate American companies which were accused of profiteering from the War. Labelled a "merchant of death" DuPont turned to radio in the mid-1930s to improve its public image. 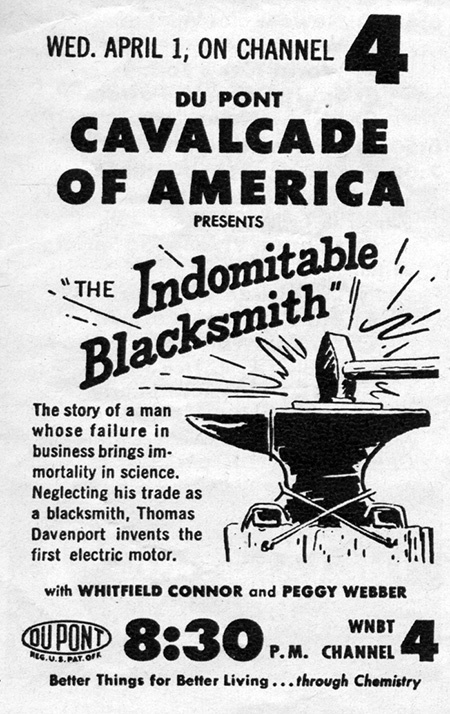 The Cavalcade of America helped to rebrand the company as one which made products that improved the lives of Americans by showcasing stories of individual courage, initiative, and achievement, especially triumphs of the human spirit over great odds. The show would embrace pacifist and sometimes even socialist ideals (gunfire was taboo on the program) which attracted a prestigious staff of writers and talent. The program premiered in 1935, and that year the regularly scheduled broadcast fell on Christmas Day. The story that day was "The Humanitarian Urge" told of how child abuse was fought in the courts when attorneys from the ASPCA represented small children as "defenseless creatures" in court who deserved the same legal protection as a puppy or kitten. The following Christmas saw the story of Emily Bissell, the humanitarian who introduced Christmas Seals as a way to raise awareness and funds for the fight against tuberculosis. 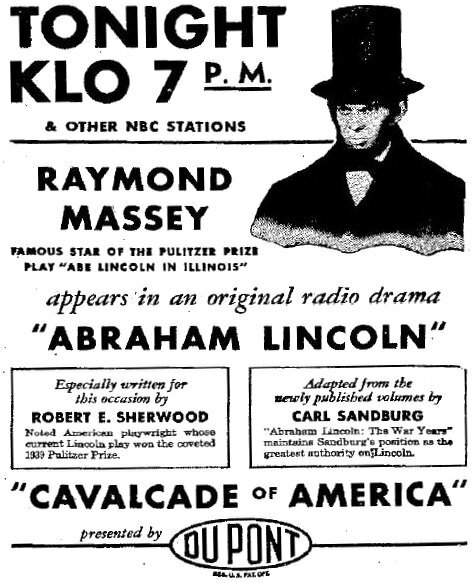 Cavalcade of America fell on Christmas Day again in 1940, and with the nation nervous over War news from Europe, the program presented an adaptation of the play "The Green Pastures" which told the story of the Old Testament from the point of view of an African American child in the Depression Era South. The story was replayed the following year, two weeks after the attack on Pearl Harbor. A Nativity play titled "A Child is Born" was presented in 1942. 1944 sees another Christmas Day broadcast with "America for Christmas", a musical tour of the United States. The official Christmas program in 1947 was on December 22, featuring Christmas music from the DuPont Chorus, but the week before was "The Day They Gave Babies Away"; a dying mother instructs her oldest boy to help find happy homes for his five siblings, but first he needs to keep the family together for one last Christmas. Cavalcade's last Christmas on the radio was 1952, with "Barbed Wire Christmas", the story of American POWs determined to attend Midnight Mass despite being forbidden by the Gestapo. Be the first to comment on "Cavalcade of America Christmas"